Once, there lived a greedy and cunning wolf in a dense forest. One day, while he was having his dinner, a bone got stuck into his throat. He tried hard to take it out, but couldn't succeed in his effort. The wolf began whining with pain. The pain was unbearable. The wolf got worried and began thinking, "The pain will subside in due course. But, what will happen if the bone doesn't come out. I won't be able to eat anything. I will starve to death." The wolf began thinking of some possible remedy to overcome theproblem. Suddenly he recalled that there was a crane who lived on the banks of a nearby lake. He immediately went to the crane and said, "My friend, I've a bone stuck deep into my throat. If you could please pull it out of my throat with your long beak, I shall pay you suitably for your help and remain ever-grateful to you." The crane saw his pitiable condition and agreed to help him. He put him long beak, and in the process, half of his neck also, deep into the throat of the wolf and pulled the bone out. 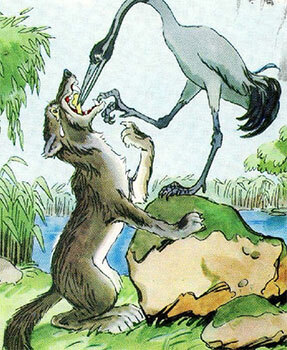 The wolf was very happy to have the bone pulled out of his throat. "Now pay me my fees, please," The crane requested. "What fees? ", said the wolf. "You put your head into my mouth and I let it out safely. That's enough of my kindness. Now get lost, otherwise, I'll kill you and eat your flesh."